Please note the items we sell are limited to customers of 18 years and over! 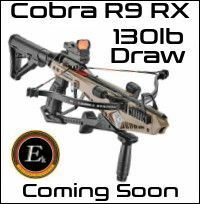 Over 150 crossbows from 36 crossbow manufacturers. Always first for new and interesting crossbows, the first to bring new crossbows and new crossbow manufacturers to the UK. For over 15 years we have had the largest range of crossbows and crossbow accessories available anywhere on the Internet. If there are crossbows or crossbow accessories you are interested in that we do not list give us a call its is very likely we can source them for you. We are also the UK's biggest Bullwhip retailer and have supplied many popular movies and TV shows. References - Should you wish to check our status as genuine retailers (a good idea when dealing with any website) please check the major crossbow manufacturers listed below who show us as dealers on their websites. Another way to check reliability is to look at review sites such as Trustpilot or type the name of the website into Google and see if they have any reviews (right hand side), don't believe a website in house reviews and testimonials they are easily faked. When buying an expensive crossbow check the retailers reviews and speak to them to make sure they are legitimate, have the knowledge and the reputation to provide the product and service you deserve for your money. "Just got the Excalibur Sapphire & EK Archery Jaguar II. Very impressed with the bows & your outstanding assistance in getting the deal done. I am now a loyal customer! Thanks again"
Here at Outdoorhobbies we specialise in crossbows and bullwhips with the biggest selection on the Internet delivered direct to your door or an alternative address if required. We can ship to most countries in the World, for more shipping information click here, the shipping costs to each country for each crossbow and bullwhip are shown on the items product page. Outdoorhobbies are the biggest UK online crossbow and bullwhip supplier offering the largest range of crossbows since 2003. With over 150 crossbows for hunting trips with crossbows or target crossbow shooting, we have the right one for you and your budget and as we offer over 150 different models we will advise you on which crossbow is the most suitable for you not the one we want to sell you. Our website will give you all the information you need on bullwhips, recurve crossbows, compound crossbows, target crossbows, hunting crossbows and we are available to contact on the phone (free), live chat and email every day from 9am - 8pm. 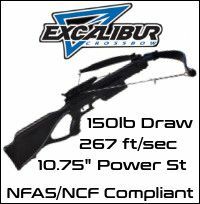 We stock Barnett Crossbows, Excalibur Crossbows, Tenpoint Crossbows, Parker Crossbows, Stryker Crossbows, Inferno Crossbows, PSE Crossbows, Mission Crossbows, Bear Archery Crossbows, Kodabow Crossbows, Scorpyd Crossbows, Wicked Ridge Crossbows, Winchester Crossbows, Killer Instinct Crossbows, Carbon Express Crossbows, Middleton Crossbows & quality entry level xbows from EK Archery, Anglo Arms Crossbows, Venom Crossbows, Man Kung Crossbows, Jandao Crossbows, Hori-zone Crossbows and Maximal Crossbows we even have the amazing Pioneer Airbow, the ultra small Ravin Crossbows, the Hickory Creek vertical crossbow, the shotgun style Zubin crossbow and crossbows from Talon Crossbows that fire ball bearings and lead projectiles. With over 150 crossbows for target shooting or crossbow hunting from 33 manufacturers we have the right one for you, if you need help on which is the best model for your needs, call us for advice, its free! We also have the biggest range of crossbow accessories and spares for crossbows available anywhere in the UK including crossbow bags cases and slings, crossbow scopes, crossbow red dot sights, crossbow quivers, crossbow cocking devices, crossbow bolts, crossbow broadhead hunting tips, crossbow sighting systems and range finders, crossbow limb and string siliencers dampeners, crossbow strings and cables and crossbow targets. Our exclusive range of leather bullwhips, Kangaroo bullwhips, Nylon Bullwhips and Leather Snakewhips is the most extensive you will find in the UK or indeed anywhere on the internet and we ship our bullwhips worldwide for £15.00 (UK £4.99). Our leather bullwhips and snakewhips are handmade from the finest materials and covered by our no quibble returns policy and 12 month free repair service. They must be good as the Kangaroo Bullwhip is featured in Game of Thrones (used by the Sand Snakes of Dorne) the most watched tv programme in the World. We stock items from the best suppliers in the world at the best prices you will find and we aim to deliver within 48 hours we even have a price match policy to ensure you get the best price possible. We have a used crossbows sales category to help you sell your old crossbow, upgrade to a new model or find a second hand bargain. We are very proud to be the official supplier of crossbows to The Royal Armouries Leeds plus many holliday parks, outdoor activity centres and corporate event companies.